I am going to be honest with you. I recommended that the RhodeCrew should review this place. It just goes to show you how a “find” can be right under your nose, and if you’re not one to try restaurants off the beaten path, treasures like AJ’s can be missed. I think one of the reason’s I hesitated for so long in stopping by AJ’s was its location. It is kind of in an area where many vacant store fronts currently reside – the patch of Main Street between the “strip” in downtown West Warwick and Route 117. Freshly baked muffins! Freshly baked “anything” for that matter, has me at first bite. 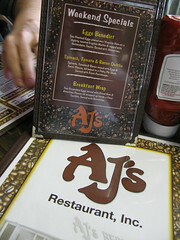 Once you walk into AJ’s for breakfast, you will feel like you are at the epicenter for breakfast in West Warwick. Recently I have been attracted by anything pistachio. 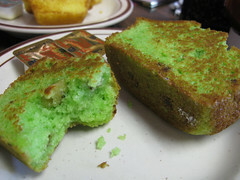 When I learned of their pistachio muffins, I went nuts. There’s nothing like the taste of a freshly baked & then grilled muffin in the morning…it tastes like….victory?? Anyway, here is what gets my orange juices flowing in the morning….grilled, I repeat, GRILLED home fries. If I walk into a breakfast joint and their home fries are deep fried, it’s a deal killer. The grilled home fry is a work of art and in certain areas in the country, they are about to be added to the endangered species list. This is why I love those Jersey diners…you never know what kind of grilled home fry concoction you’ll be served –but it will be good and grilled. AJ’s does a great job of preserving the art of the home fry. Slap on some ketchup and if that is all I eat for breakfast, I am content. Doing the low-carb thing? Great, hand over your home fries and enjoy your plain egg whites! 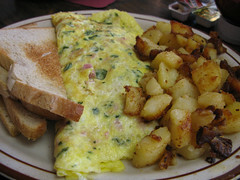 Lately, I have been real picky about my omelet’s color. I prefer my omelets yellow as in “scrambled egg” yellow. I don’t like it when an omelet shows up on my plate like it didn’t put on any sunscreen after a hot sunny day at Scarborough Beach. I requested my omelet “yellow” and it showed up yellow. Poached eggs – here’s another deal killer. If you fork a poached egg whether it is Benedict or solo, there better be a lava flow of yolk immediately following. AJ’s has consistently nailed this often overlooked detail on poached eggs. AJ’s employs the team approach in serving you. You may be initially served by one waitress but by the end of the meal, almost every waitress will have made it over to your table with one thing or the other. I will warn you…they will drown you in fresh brewed coffee. I ha d to eventually put the jelly tray on top of my coffee cup to let them know I didn’t need a refill after attempt #5! AJ’s Restaurant is an example of what every town needs…a local breakfast joint where the menu is as straightforward and unpretentious as its staff. I had a feeling this might be a special place when I first walked into a busy AJ’s for breakfast one morning and could tell that the only person who had not been there before was me! If this revelation should ever strike you upon entering a new restaurant, do not fear the unknown, but embrace the journey for which you are about to embark. The standout menu items were the freshly baked selections from within the glass case at the counter. Scott was right on the money about the muffins. We had pistachio, corn and blueberry which were all hot, moist, light and excellent. 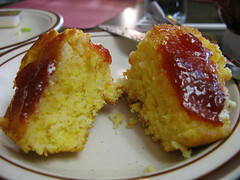 Believe me, corn muffins are easy to make badly, and if you happen to violate the golden rule of serving bakery the same day, corn muffins can be a downright danger if they get lodged in your throat without proper ventilation and irrigation. In addition to the muffin appetizer was my order of eggs Benedict. Getting poached eggs cooked properly is a challenge for even the best restaurants, and always a gamble to order when dining with others because if the yolks are served hard-cooked, your friends will be done eating by the time the kitchen has rectified the order. Well, fear not fellow diners, AJ’s served perfectly cooked poached eggs! 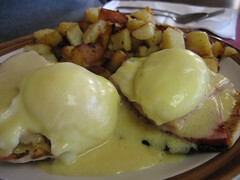 The Hollandaise sauce could have used a bit more lemon and seasoning but was still buttery and good. The potatoes were grilled perfectly, but also could have used some salt, pepper and onion. This entry was posted in Breakfast and tagged benedict, blueberry, Breakfast, corn, crepes, diner, hash browns, hollandaise, muffins, pistachio, rhode island, Rhode Island Restaurant Reviews, west warwick. Bookmark the permalink.